Although clinical interpretation originated with Freud, the latter's positivist preference for purely observational methods made him ambivalent toward interpretive methods. According to Rubovits-Seitz, the legacy of Freud's positivism still pervades clinical thinking and interferes with progress in investigating and improving interpretive methods. He reviews the paradigm shift in general science from positivism to postpositivism by way of demonstrating the compatibility of interpretive inquiry with a postpositivist approach. Post-Freudian models of clinical interpretation are evaluated, andclinical methods of interpretation are compared with interpretive approachesin nonclinical fields. A detailed discussion of the neglected problem ofjustifying interpretations incorporates evaluations of specific justifyingprocedures and a case report illustrating applications of such methods. Thework concludes with a consideration of common but avoidable errors in clinicalinterpretation along with remedial strategies for dealing with them. 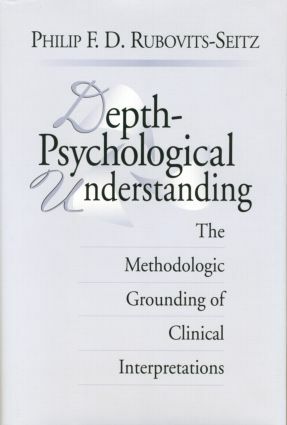 Following Depth-Psychological Understanding, clinicians may no longer take for granted the interpretive process and the accuracy of their own interpretations. Rubovits-Seitz's scholarly survey marks a major advance in comprehending the methodology of clinical interpretation and in setting forth both the problems and promise of interpretive methods. "I read Depth-Psychological Understanding, enraptured as by a detective thriller. For 100 years psychoanalysis has been plagued by the crucial problem of interpretation, strangely neglected by Freud, his disciples, and their critics. Rubovits-Seitz examines the question with wide-ranging erudition, clinical sensitivity, philosophical sophistication, and scrupulous intellectual honesty. It is an amazing scholarly achievement that will be the definitive treatise for years to come." "As our view of the world shifts ever further from the belief that truth is given, the time has come to take a fresh look at the problem of interpretation. We could find no better guide that Philip Rubovits-Seitz. In a scholarly, optimistic, and wide-ranging survey, he helps us see the underlying commonality that binds psychoanalysis to the other interpretive disciplines and to the unexplored field of commonsense psychology. In doing so, he helps us guard against the temptation to substitute pattern-making for pattern-finding and encourages us to join in the search for better answers to this age-old problem. Highly recommended." Philip F. D. Rubovits-Seitz, M.D., is Clinical Professor of Psychiatry, George Washington University Medical Center. He was previously Director of Psychiatric Research, Indiana University; Visiting Professor of Psychiatry, University of Cincinnati; and Staff Member, The Chicago Institute for Psychoanalysis. He has received a number of national and other awards for research and teaching.